Neptune trojans are bodies that orbit the Sun near one of the stable Lagrangian points of Neptune, similar to the trojans of other planets. They therefore have approximately the same orbital period as Neptune and follow roughly the same orbital path. 22 Neptune trojans are currently known, of which 19 orbit near the Sun–Neptune L4 Lagrangian point 60° ahead of Neptune and three orbit near Neptune's L5 region 60° behind Neptune. The Neptune trojans are termed 'trojans' by analogy with the Jupiter trojans. 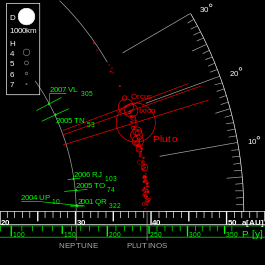 It would have been possible for the New Horizons spacecraft to investigate 2011 HM102, the only L5 Neptune trojan discovered by 2014 detectable by New Horizons, when it passed through this region of space en route to Pluto. However, New Horizons may not have had sufficient downlink bandwidth, so it was decided to give precedence to the preparations for the Pluto flyby. The orbits of Neptune trojans are highly stable; Neptune may have retained up to 50% of the original post-migration trojan population over the age of the Solar System. Neptune's L5 can host stable trojans equally well as its L4. Neptune trojans can librate up to 30° from their associated Lagrangian points with a 10,000-year period. Neptune trojans that escape enter orbits similar to centaurs. Although Neptune cannot currently capture stable trojans, roughly 2.8% of the centaurs within 34 AU are predicted to be Neptune co-orbitals. Of these, 54% would be in horseshoe orbits, 10% would be quasi-satellites, and 36% would be trojans (evenly split between the L4 and L5 groups). The unexpected high-inclination trojans are the key to understanding the origin and evolution of the population as a whole. The existence of high-inclination Neptune trojans points to a capture during planetary migration instead of in situ or collisional formation. The estimated equal number of large L5 and L4 trojans indicates that there was no gas drag during capture and points to a common capture mechanism for both L4 and L5 trojans. The capture of Neptune trojans during a migration of the planets occurs via process similar to the chaotic capture of Jupiter trojans in the Nice model. When Uranus and Neptune are near but not in a mean-motion resonance the locations where Uranus passes Neptune can circulate with a period that is in resonance with the libration periods of Neptune trojans. This results in repeated perturbations that increase the libration of existing trojans causing their orbits to become unstable. This process is reversible allowing new trojans to be captured when the planetary migration continues. For high-inclination trojans to be captured the migration must have been slow, or their inclinations must have been acquired previously. In 2015, the IAU has adopted a new naming scheme for Neptune trojans, which are to be named after Amazons, with no differentiation between objects in L4 and L5. The Amazons were an all-female warrior tribe that fought in the Trojan War on the side of the Trojans against the Greeks. As of 2018, the only named Neptune trojan is 385571 Otrera, after Otrera, the first Amazonian queen in Greek mythology. As of October 2018, 22 Neptune trojans are known, of which 19 orbit near the Sun–Neptune L4 Lagrangian point 60° ahead of Neptune, three orbit near Neptune's L5 region 60° behind Neptune, and one orbits on the opposite side of Neptune (L3) but frequently changes location relative to Neptune to L4 and L5. These are listed in the following table. It is constructed from the list of Neptune trojans maintained by the IAU Minor Planet Center and with diameters from Sheppard and Trujillo's paper on 2008 LC18, unless otherwise noted. (309239) 2007 RW10, a temporary quasi-satellite of Neptune. ^ After the asteroid belt, the Jupiter trojans, the trans-Neptunian objects and the Mars trojans. ^ a b c d e "List Of Neptune Trojans". Minor Planet Center. Archived from the original on 2012-05-25. Retrieved 2012-08-09. ^ a b c d e f g h i j k l m n o Sheppard, Scott S.; Trujillo, Chadwick A. (June 2006). "A Thick Cloud of Neptune Trojans and Their Colors" (PDF). Science. 313 (5786): 511–514. Bibcode:2006Sci...313..511S. doi:10.1126/science.1127173. PMID 16778021. Archived (PDF) from the original on 2010-07-16. Retrieved 2008-02-26. ^ Jewitt, David C.; Trujillo, Chadwick A.; Luu, Jane X. (2000). "Population and size distribution of small Jovian Trojan asteroids". The Astronomical Journal. 120 (2): 1140–7. arXiv:astro-ph/0004117. Bibcode:2000AJ....120.1140J. doi:10.1086/301453. ^ a b c David Powell (30 January 2007). "Neptune May Have Thousands of Escorts". Space.com. Archived from the original on 15 August 2008. Retrieved 2007-03-08. ^ a b Scott S. Sheppard (2010-08-12). "Trojan Asteroid Found in Neptune's Trailing Gravitational Stability Zone". Carnegie Institution of Washington. Archived from the original on 2010-08-15. Retrieved 2007-12-28. ^ a b Stern, Alan (May 1, 2006). "Where Is the Centaur Rocket?". The PI's Perspective. Johns Hopkins APL. Archived from the original on March 9, 2011. Retrieved June 11, 2006. ^ a b Parker, Alex (April 30, 2013). "2011 HM102: A new companion for Neptune". The Planetary Society. Archived from the original on October 9, 2014. Retrieved October 7, 2014. ^ a b c d e f g h i Sheppard, Scott S.; Trujillo, Chadwick A. (2010-08-12). "Detection of a Trailing (L5) Neptune Trojan". Science. AAAS. 329 (5997): 1304. Bibcode:2010Sci...329.1304S. doi:10.1126/science.1189666. PMID 20705814. ^ a b Parker, Alex (2012-10-09). "Citizen "Ice Hunters" help find a Neptune Trojan target for New Horizons". www.planetary.org/blogs. The Planetary Society. Archived from the original on 2012-11-01. Retrieved 2012-10-09. ^ Alexandersen, M.; Gladman, B.; Greenstreet, S.; Kavelaars, J. J.; Petit, J. -M.; Gwyn, S. (2013). "A Uranian Trojan and the Frequency of Temporary Giant-Planet Co-Orbitals". Science. 341 (6149): 994–997. arXiv:1303.5774. Bibcode:2013Sci...341..994A. doi:10.1126/science.1238072. PMID 23990557. ^ Kortenkamp, Stephen J.; Malhotra, Renu; Michtchenko, Tatiana (2004). "Survival of Trojan-type companions of Neptune during primordial planet migration". Icarus. 167 (2): 347–359. arXiv:astro-ph/0305572. Bibcode:2004Icar..167..347K. doi:10.1016/j.icarus.2003.09.021. ^ Nesvorný, David; Vokrouhlický, David (2009). "Chaotic Capture of Neptune Trojans". The Astronomical Journal. 137 (6): 5003–5011. Bibcode:2009AJ....137.5003N. CiteSeerX 10.1.1.693.4387. doi:10.1088/0004-6256/137/6/5003. ^ Gomes, R.; Nesvorny, D. (2016). "Neptune trojan formation during planetary instability and migration". Astronomy & Astrophysics. 592: A146. Bibcode:2016A&A...592A.146G. doi:10.1051/0004-6361/201527757. ^ Parker, Alex (2015). "The intrinsic Neptune Trojan orbit distribution: Implications for the primordial disk and planet migration". Icarus. 247: 112–125. arXiv:1409.6735. Bibcode:2015Icar..247..112P. doi:10.1016/j.icarus.2014.09.043. ^ Ticha, J.; et al. (10 April 2018). "DIVISION F / Working Group for Small Body Nomenclature Working Group for Small Body Nomenclature. THE TRIENNIAL REPORT (2015 Sept 1 - 2018 Feb 15)" (PDF). IAU. Retrieved 25 August 2018. ^ "385571 Otrera (2004 UP10)". Minor Planet Center. 30 November 2015. Retrieved 4 August 2017. ^ "2011-07-28 Tracking News". www.hohmanntransfer.com. Archived from the original on 31 March 2016. Retrieved 29 April 2018. ^ a b c "Conversion of Absolute Magnitude to Diameter". www.physics.sfasu.edu. Archived from the original on 23 March 2010. Retrieved 29 April 2018. ^ Gerdes, D. W.; Jennings, R. J.; Bernstein, G. M.; Sako, M.; Adams, F.; Goldstein, D.; Kessler, R.; Abbott, T.; Abdalla, F. B.; Allam, S.; Benoit-Lévy, A.; Bertin, E.; Brooks, D.; Buckley-Geer, E.; Burke, D. L.; Capozzi, D.; Rosell, A. Carnero; Kind, M. Carrasco; Carretero, J.; Cunha, C. E.; D'Andrea, C. B.; da Costa, L. N.; DePoy, D. L.; Desai, S.; Dietrich, J. P.; Doel, P.; Eifler, T. F.; Neto, A. Fausti; Flaugher, B.; Frieman, J.; Gaztanaga, E.; Gruen, D.; Gruendl, R. A.; Gutierrez, G.; Honscheid, K.; James, D. J.; Kuehn, K.; Kuropatkin, N.; Lahav, O.; Li, T. S.; Maia, M. A. G.; March, M.; Martini, P.; Miller, C. J.; Miquel, R.; Nichol, R. C.; Nord, B.; Ogando, R.; Plazas, A. A.; Romer, A. K.; Roodman, A.; Sanchez, E.; Santiago, B.; Schubnell, M.; Sevilla-Noarbe, I.; Smith, R. C.; Soares-Santos, M.; Sobreira, F.; Suchyta, E.; Swanson, M. E. C.; Tarlé, G.; Thaler, J.; Walker, A. R.; Wester, W.; Zhang, Y. (28 January 2016). "Observation of Two New L4 Neptune Trojans in the Dark Energy Survey Supernova Fields". The Astronomical Journal. 151 (2): 39. arXiv:1507.05177. Bibcode:2016AJ....151...39G. doi:10.3847/0004-6256/151/2/39. ^ "Distant EKOs, 55". Archived from the original on 2013-05-25. Retrieved 2012-07-24. ^ "Orbit and Astrometry for 05TN74". www.boulder.swri.edu. Archived from the original on 29 April 2018. Retrieved 29 April 2018. ^ de la Fuente Marcos; de la Fuente Marcos (2012). "(309239) 2007 RW10: a large temporary quasi-satellite of Neptune". Astronomy and Astrophysics Letters. 545: L9. arXiv:1209.1577. Bibcode:2012A&A...545L...9D. doi:10.1051/0004-6361/201219931. Horner, J.; Lykawka, P. S. (2010). "Planetary Trojans – the main source of short period comets?". International Journal of Astrobiology. 9 (4): 227–234. arXiv:1007.2541. Bibcode:2010IJAsB...9..227H. doi:10.1017/S1473550410000212.